My school is a STEM magnet school and unfortunately, that leads to a disproportionate number of male students. This year the ratio was 65% male, 35% female, which led to many of my female students feeling disenfranchised. 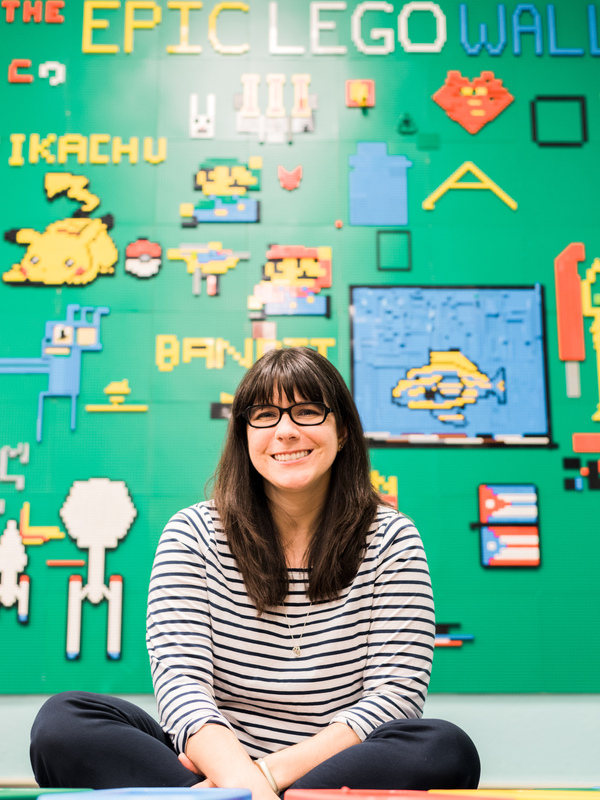 I wanted to do something to help create a safe environment for my girls to explore STEM and to build a community with one another, so this year I partnered with several science teachers to start a STEMgirls club at our school. At our first meeting, we talked about possibilities of projects and activities that we would like to do. 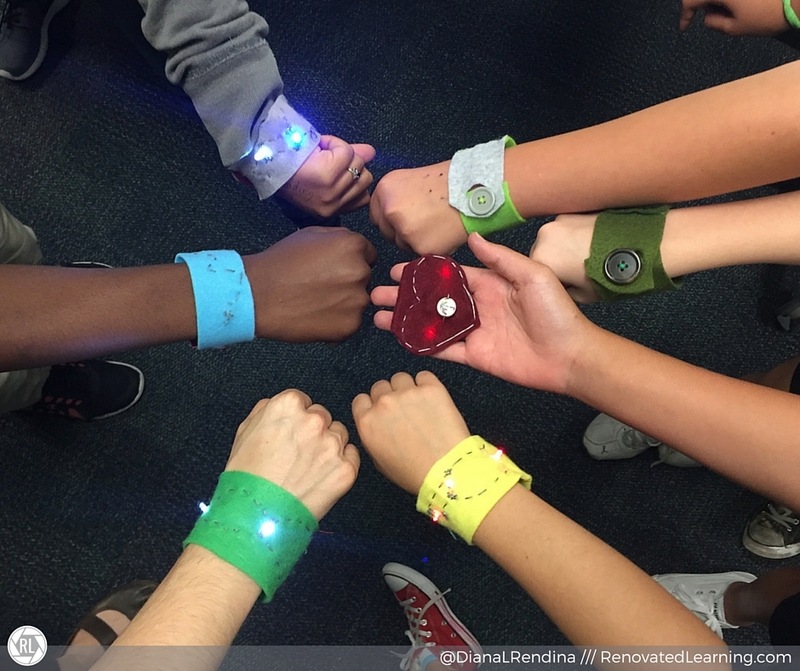 When I mentioned a workshop I had seen others do where you could sew light up bracelets, my students got really excited. Thus, our Circuit Bracelet Workshop was born. 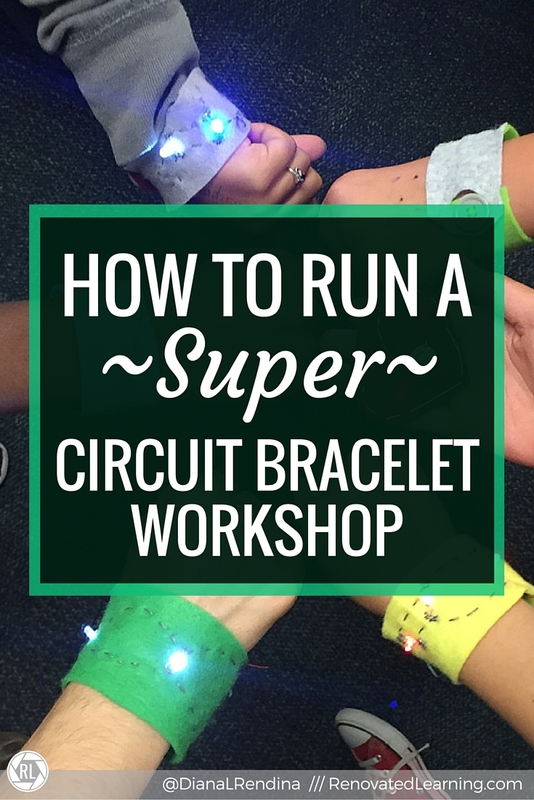 How a circuit bracelet workshop runs in your space will vary greatly. For me, I found that it worked best when I had at least one other adult helping me and a ratio of one adult for every five students. Learning how to sew circuits requires a lot of one-on-one help, and if you have too many students at once, many start to get frustrated and give up. Note: I’d like to mention early on that I first learned how to sew a circuit from The Tinkering Studio, who has an AMAZING and detailed set of instructions here. Print those out and refer to them. They’re awesome. 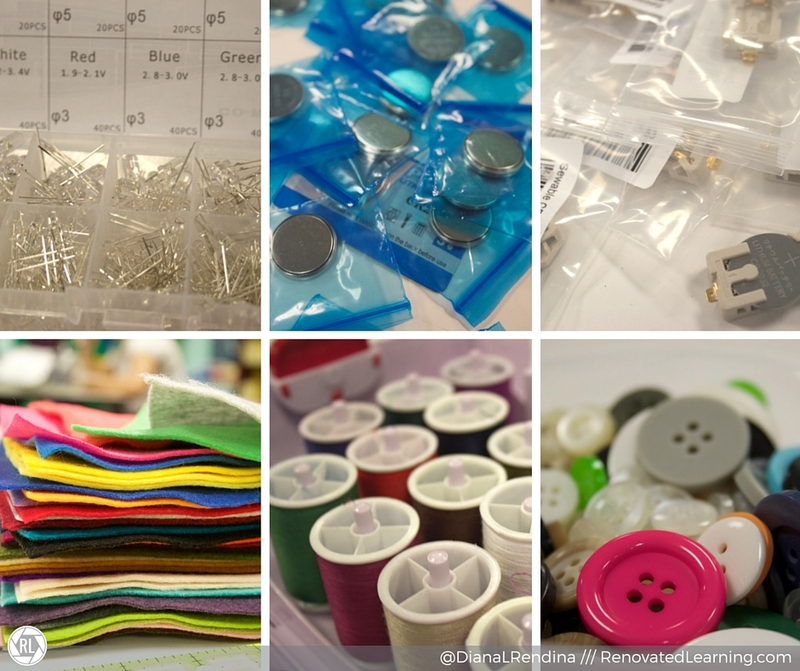 Materials needed include LEDs, batteries, sewable battery holders, felt, thread and buttons. 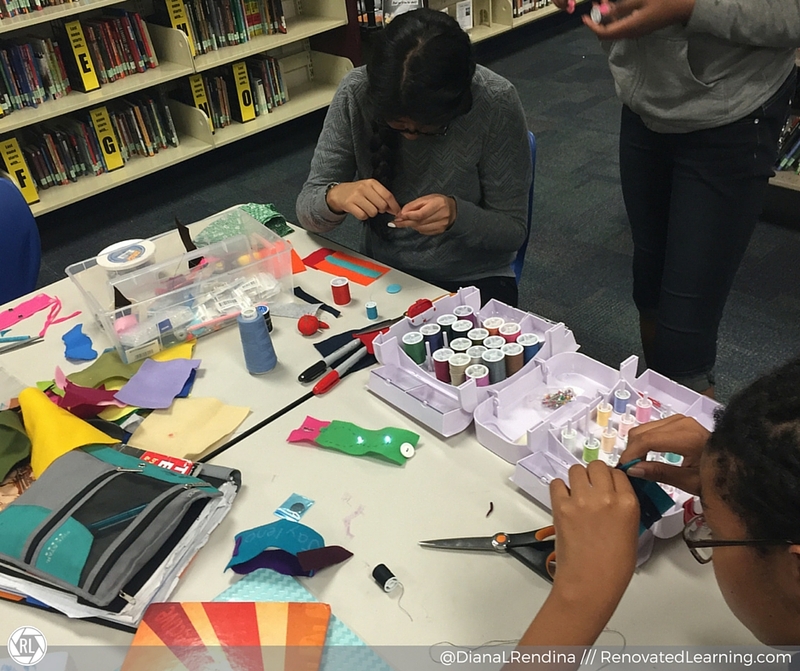 We got the supplies for our circuit bracelets through a DonorsChoose project, but many of these are arts and crafts supplies and are very affordable. Many of my students (like, almost all of them) had never sewn by hand before. Only a handful had used a sewing machine. So the first part of the lesson was literally how to thread a needle and sew on a button. Take your time with this one, and make sure to start by demonstrating to the whole group. There will likely be some mistakes and students might need some hand-holding here. As they get the hang of it, you’ll see their confidence increase. Once they’ve sewn on the button, they can create a button hole on the other side of their bracelet. Reinforcing the buttonhole is optional, but I found that having my students do that helped to solidify their sewing skills and got them ready for sewing the circuits. 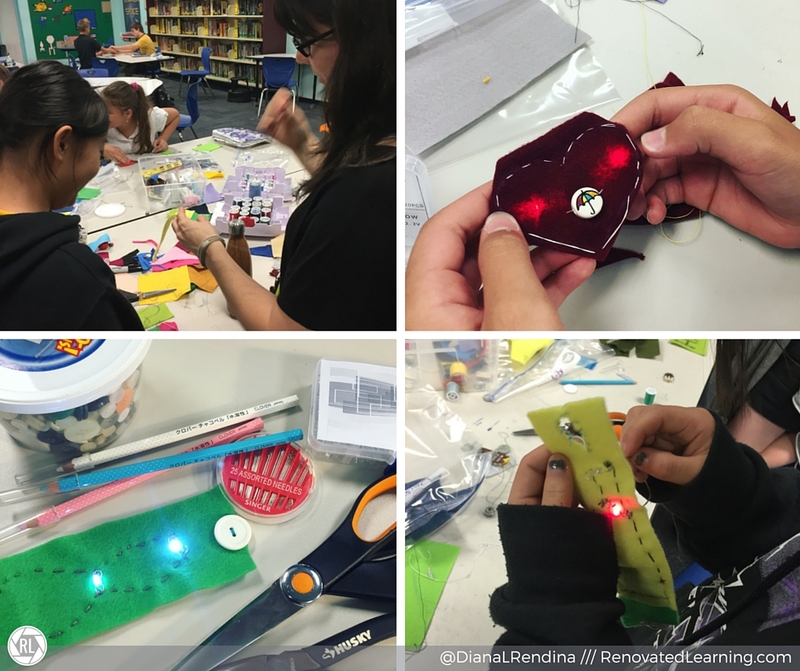 I like to introduce sewn circuits and LEDs one step at a time to help students to connect how they are powered. We start by just lighting up the LED by putting it around the battery. This helps students to associate the positive and negative sides with the LED and it lets them test if multiple LEDs will work together. Several of my students created parallel circuits (with two or more LEDs) and we discovered that certain colors will short the other ones out. Using needle nose pliers (or tweezers) grasp the tip of the LED leg and twirl it in towards the center. This will create a nice little curl which will make it easier to sew the LED on. Repeat for the other leg. Check out the instructions from The Tinkering Studio to see a detailed image of what this looks like. Hopefully, your students have brainstormed how they want to layout their sewn circuit. It’s important to remind them that the positive and negative threads can never touch – I like to demonstrate this with the sample bracelet by touching the two sides together and shorting it. Have students attach the battery holder with the battery side facing up using regular thread first. You want it to be secure. Then students can thread the needle with conductive thread. Go over the battery holder several times to make sure that the thread is connected with the battery holder. Then, using a simple over under stitch (or something more complicated if they’d like) start stitching the circuit. When you get to the LED, go around the leg several times to get it secure and create a good connection. Make sure to tie off the thread securely at the end – I like to go back through and tie it to itself. Repeat with conductive thread for the other side, being sure not to cross the two sides. Once you make it to the LED with the second thread, it should light up and the circuit bracelet is done! Of course, now is a great time to have students decorate them with additional buttons and embroidery. As you might have seen in my pictures, one of my students decided to try a variation. When the group first came in, she went off by herself and doodled at the whiteboard table for awhile. I figured she would come and work on the project when she was ready. Eventually she joined us and decided that she didn’t want to make a bracelet. Instead, she designed a light-up plushie heart. One of my students just wanted to embroider their bracelet rather than add the LEDs. 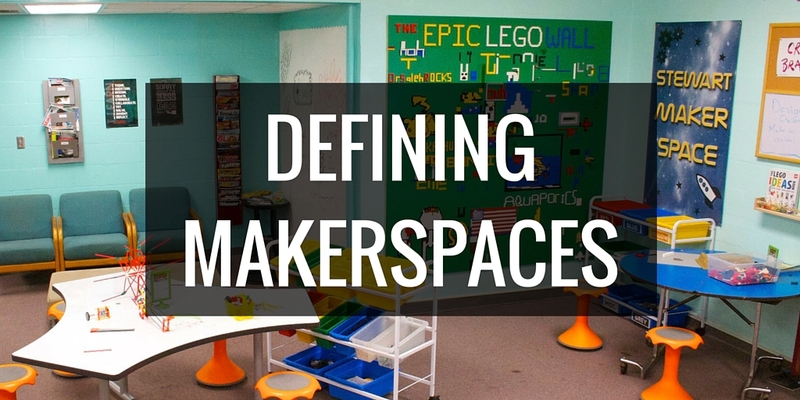 Leave enough flexibility to let your students do what interests them. 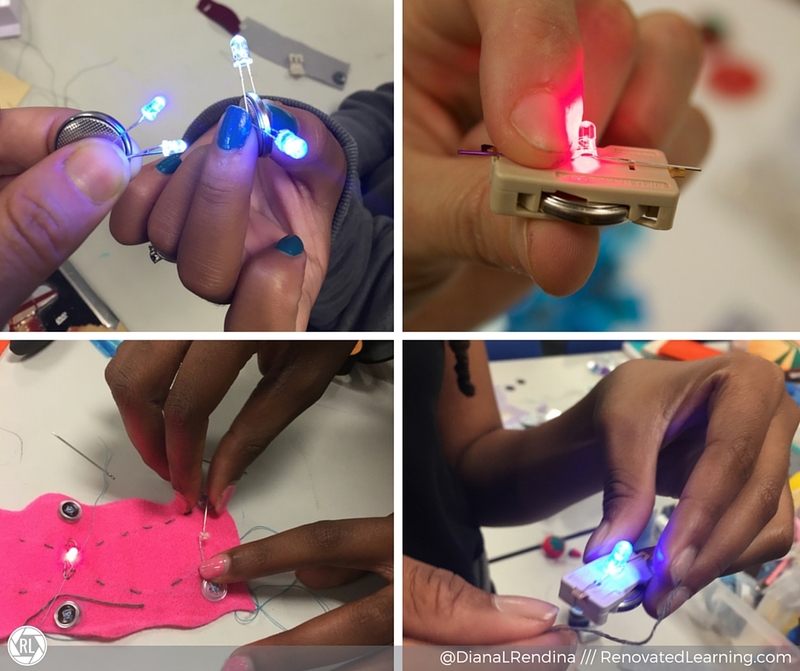 Have you ever tried sewn circuits with your students? How did it work out?